Jetset Plumbing provides Leak Detection Morningside service for Owners, Landlords, Real Estate Agents and Lessors. You may encounter a leak you cannot see directly, there may be water pooling in an odd place, a damp spot on the lawn, a letter from the council or a high water bill. Our expert leak detectors will find your leak fast and fix it on the spot! 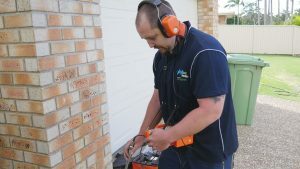 Leak Detection Morningside use the latest non-invasive leak detection technology the High Frequency Ultra Sonic Listening Device to detect precisely where even the smallest leak is coming from. The greatest advantage of our listening devices is that we don’t need to punch holes into walls or drill into concrete to find the leak, our listening devices can detect leaks through walls and concrete! When you reach out to Jetset Plumbing Leak Detection for services in your residential or commercial space, you can trust that you’re receiving outstanding workmanship and customer service from Jetset Plumbing. Visit the Plumber Morningside resources websites for more information.